The new Chromium™ Single Cell V(D)J Solution is a high-throughput method for profiling paired V(D)J transcripts from hundreds to millions of lymphocytes. The Chromium Single Cell V(D)J Solution has been optimized to provide a cost-effective application for the assembly of full V(D)J sequences—5’ untranslated region (UTR) to constant regions—from short-read sequencing on a cell-by-cell basis. Five-prime barcoding limits bias caused by complex multiplex PCR, enables the detection of germline and somatic variants across the entire V(D)J segment, and supports cell type classification or phenotyping. 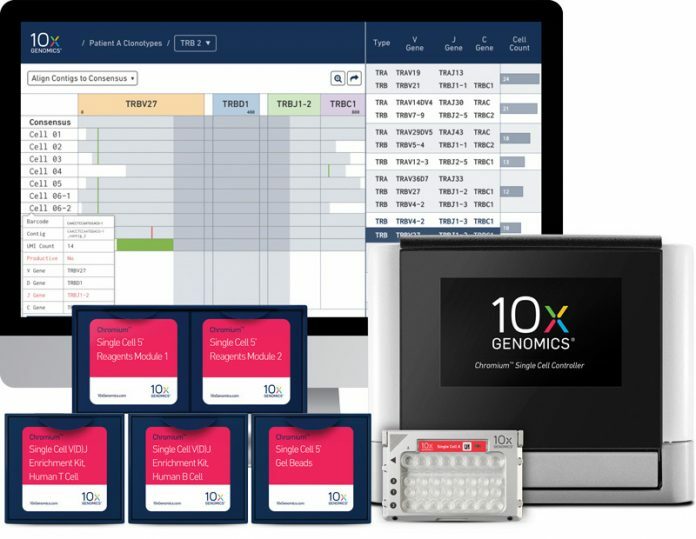 The comprehensive solution includes necessary chemistry and microfluidics consumables as well as a complete software suite for the rapid analysis and visualization of large V(D)J datasets, designed for researchers without bioinformatics expertise.